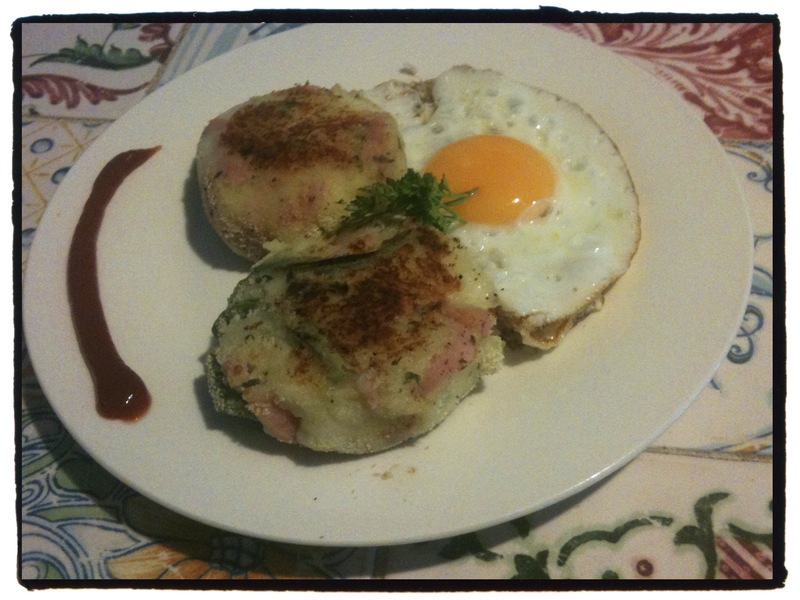 Breakfast | La Rosilla - Lifestyle and food. I was on the early shift this morning, taking No1 daughter to catch the bus, normally the job of my OH, but he is having a rare day off – well not really off, painting the outside of La Rosilla is his task for today, I thought I’d better soften the blow with a warm scrummy breakfast. Also feeling like I’ve been up for hours, my metabolism is already thinking its time for my refueling, something I don’t normally do till mid morning, when I can sit, calm, fresh made coffee in hand and enjoy it. Today I whipped up some cheese and ham potato cakes, with a fried egg on the side and a swirl of tomato ketchup, well I thought a swirl made my TK look a little more arty ! It’s a quick dish to prepare , and I always make extra mash potato to use in dishes like this, or croquetas and fab Bubble and Squeak. A little salt and black pepper. Dip into breadcrumbs, and little fry in some Olive Oil until golden. Serve with a poached egg, or fried egg. Add a side sauce of your choice , TK, Daddies or Chilli. Well off to paint we go…but first a Cafe Solo, to charge my energy levels.